The dense plume technique is one of the solutions envisaged for storing captured CO2 in the oceans. This technique is based on the fact that sea water loaded with dissolved CO2 is denser than normal sea water and that below a depth of 3,000 metres, liquid CO2 is denser than sea water. Thus, when the concentration of carbon dioxide is high, a density current is created, which then dives to the ocean floors. CO2 then accumulates on the sea bed in the form of a liquid CO2 lake and solid CO2 hydrate (clathrate). Although water with a high concentration of CO2, or liquid CO2, does not much with sea water, the carbon dioxide ends up dissolving in the surrounding water, then returning to the atmosphere. Depending on the depth and currents, the lifespan of a CO2 lake may be several millennia. The idea is therefore to inject, a mixture of sea water and compressed CO2 at over 3,000 metres using a slurry pipeline, to store captured carbon dioxide on the ocean bed. However, little is known about the impact this storage technique may have on sea bed ecosystems. No one knows how organisms in this environment would adapt to a significant change in the concentration of CO2 and acidity, but it is known that these organisms have evolved in an environment that has undergone very little variation. 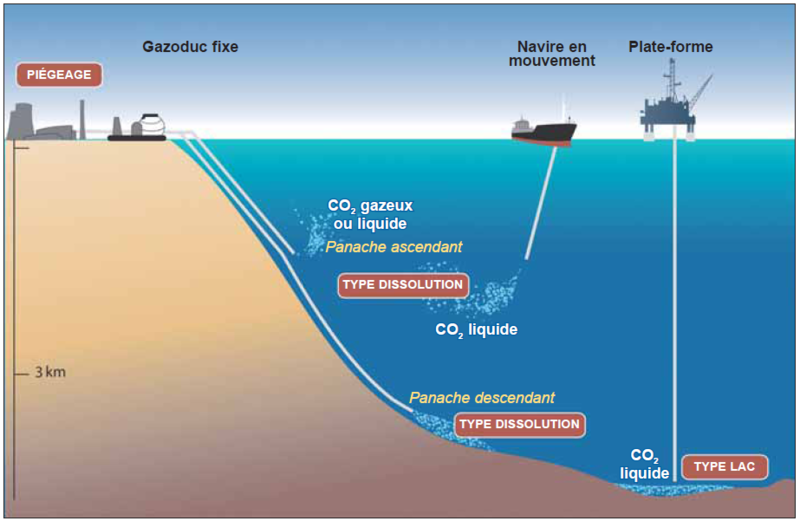 study the behaviour of deep and dense CO2 layers on the ocean bed. Moreover, injecting CO2 into the oceans presents a legal problem. In fact, the London Convention prohibits the dumping of waste at sea. The question is therefore whether or not CO2 can be considered to be waste.